We know the facts: massage is good for us. It’s a proven mood booster, stress reliever and body rejuvenator. When it comes to your massage choices, there are a lot of options out there. We’ve put together some stats to break down which massage service is best suited to your lifestyle by comparing Blys home massages with day spas such as Endota Spa – one of the main day spa chains in Australia. Home massage and day spa massages both have their benefits. 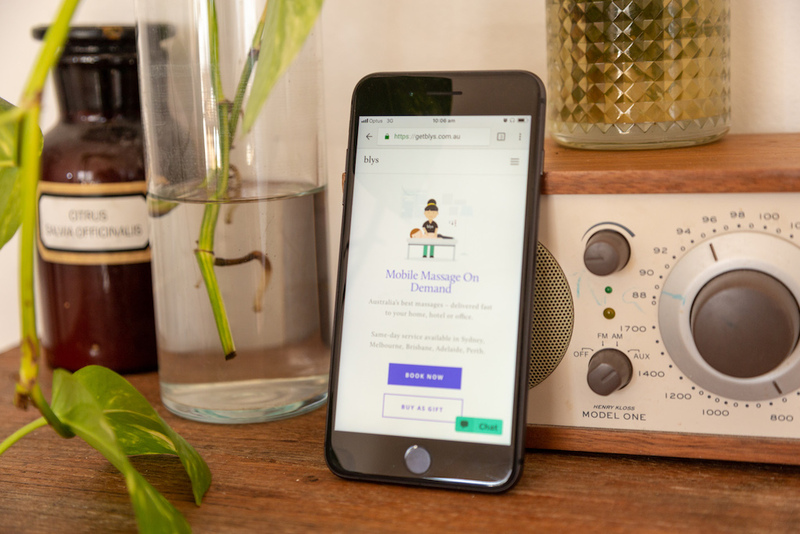 Blys, as a consumer platform, allows clients to customise their massage to suit their needs. You can choose your massage date, time, length, style, location and preferred gender of your therapist. Since Blys operates from 8am to midnight every day of the week, clients enjoy the convenience and flexibility that a mobile massage service provides. Bookings can also be made on the same day to fulfil your sudden massage cravings. Blys therapists can also provide health fund rebates depending on your provider and massage type. Head to our Help Center for all the details. A day spa provides an atmospheric, dedicated space designed to maximise relaxation. Some day spas, like Endota Spa, also provide complementary services like comfortable waiting lounges and organic teas, which is great for after the drive. Pamper packages are on offer at some day spas, and these establishments usually have their own products for sale for beauty or skincare. There’s one very important thing to consider when you’re arranging your next massage, and that is that day spas are, for the most part, foremost for beauty therapy. This means that while these establishments may offer massage therapies (even branding them as “specialty” massages), this is not a guarantee that the services they provide are legitimate, standardised massage therapy treatments (that’s a mouthful). As for Blys, every therapist holds a minimum of Certificate IV qualification in massage therapy and has a minimum 200 hours practical hands-on professional experience, is thoroughly vetted, qualified, and experienced in a variety of massage forms, including remedial massage. These qualifications can require years of study and incorporate an understanding of body sciences and physiology. In contrast, massage is just a tiny element of Beauty Therapy courses – as little as one day’s training! Just something to remember when choosing where to have your next massage. Now that we have that little disclaimer out of the way, let’s look at some figures. Suppose we can look at the numbers, too. We’ve looked at the numbers for 7 other establishments that offer massage – three hotel spas and four day spas. 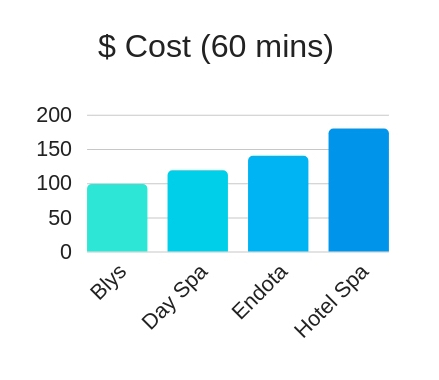 Of the four day spas we analysed, a 60 minute massage will cost an average of $119, which is $20 more than a 60-minute Blys massage in whatever style you prefer. From the three hotels we sampled, we’ve calculated that for a 60 minute massage you’ll probably pay $180 on average. Blys has hotel partnerships around Australia that offer the same competitive home prices with the convenience of in-room service. In-room hotel massage is just as sophisticated and fancy as a hotel spa would be, just without the extra glitz and fluff. At their cheapest, Endota offer a 30-minute express massage, which is great if you’re short on time and want a quick fix for tension in the shoulders or back. However, if those minutes are what you’re lacking, you’ve got to consider travel time. Endota trading hours vary by location, with some stores closing at 6pm and others open as late as 8pm. If you can nip in to your closest store after work, more power to you. If not, Blys therapists operate from 8am-midnight every day of the week. A home massage does not have to be rushed in after work hours before the spa shuts – with home massage services, your home is the spa! Endota’s express massage is 29%* cheaper than a Blys massage, but 50% shorter, so essentially you’ve paid for 71%* of a 60 minute Blys massage (in a style of your choice, no less). For just $29* more, you could receive a massage that is twice as long and requires no travel. A standalone one hour Endota massage is $120*, which is 17.5%* pricier than a 1-hour Blys massage. The longest Endota massage is 40 minutes shorter than the longest Blys massage. Endota’s prices vary by location, and since they offer a range of spa packages – massage alongside facials and manicures – it might be worth paying a bit more to incorporate these little extras into your spa day. At least then you’re getting the most out of your trip to the day spa (before you’ve got to travel home again). *based on lowest advertised price. Does massage bring all the boys to the yard? If we’re being honest, we know that the men of the world might be feeling a little left out by all this chat of “day spas” and “pampering”, but the truth is that they need it just as much as women do! In fact, 40% of our client base here at Blys is male. Endota brands itself as a women-centric spa, and this is a common theme in the day spa world. This is probably due to association with, and advertising of, beauty services like facials, mani-pedis, waxing and the like. Women make up 95% of Endota’s team, which aligns with this idea. However, a recent look into our own booking requests has revealed that there has been a spike in the request for male massage therapists (from bookings made by men and women). This likely correlates to the aftermath of the sports season and subsequent preference for stronger massages, like a deep tissue or sports massage. That isn’t to say that female therapists can’t provide ripper remedial massages – of course they can! – but the notion of male therapist equals strong massage is another common one. The bottom line is yes, massage can bring all the boys to the yard, and leave them feeling better for it. What’s in it for the therapists? You may be wondering how Blys manages to provide top-quality massages at such competitive prices. Amazingly, therapists aren’t paid in peanuts – quite the opposite, in fact. Whilst the average day spa rate is $25 an hour, Blys therapists earn three times that much at $75 an hour. So what do I choose?! The best way to decide which service is right for you is to ask, “why do I even want a massage?” Day spas and hotel spas offer specialised beauty therapy massages that aim to pamper, spoil and make you feel queenly, so if you’re after a pampering – maybe want some scented balms and nice creams slathered all over your body – then a spa might well be the place for you. They can be atmospheric and designed to set the desired mood. Some offer lounge, beverage and sauna rooms, which is great if you want to spoil yourself or the girls to a day at the spa. If you have a spa close by and want to feel glamorous and experience the soothing atmosphere of a lovely getaway like Endota, then go for it. Just keep in mind that Day Spas tend to operate within traditional 9-5 work hours, so it can be very tricky to work out a time to get there. When you tack on travelling to and from the spa (which may just end up undoing the whole relaxation process) you’ve got some pros and cons to weigh up. Blys also offer those relaxing massages that leave you feeling pristine, and do it without having you set foot outside (and risk spoiling the afterglow). Blys home massage therapist take travel, time and stress out of your massage to maximise your comfort and convenience, perfect for the busy mum, working dad or on-call businessperson. Since Blys is an on-demand service, there’s no need to plan ahead, with local therapists available to fit your schedule and not the other way around. If you require something more intense due to an injury, strain, chronic discomfort or pain, then a day spa will likely not address your needs adequately. Fortunately, therapists on the Blys platform are trained in remedial deep tissue and sports massage therapies, with the added convenience of travelling to your home, office or hotel (because we know those pangs can be pretty rough). By the time work is over for the day, you can really start to feel the strain of the desk or heavy lifting. With therapists operating until midnight every day of the week, sliding a massage into your schedule is so easy. Pregnancy massages are also available to target the unique nags and aches of expecting mums. You can read about those benefits in this blog post. All of this is possible to enjoy in the comfort and familiarity of your own home. Keep the lounge room set up casual, or dress up your home spa with incense and a plant. The amount of effort you want to put in is entirely up to you! Book your next home massage with Blys and see for yourself. Next PostSwedish Relaxation Massage: The Best Form Of Stress Relief?